We are all of a piece, and not put together like AI robots, nor are we mere animals. 1 BUT the foregoing arguments, according to the opinion of Plato, can be answered, so far as the matter in hand is concerned. For Plato holds that in us the same soul is not intellective, nutritive, and sensitive. Hence, even if the sensitive soul were the form of the body, we should not have to conclude that an intellectual substance can be the form of a body. That this opinion is impossible, we must show as follows. Things that are ascribed to one same thing according to various forms, are predicated of one another accidentally: for a white thing is said to be musical accidentally, because whiteness and music are ascribed to Socrates. Consequently if in us the intellective, sensitive, and nutritive soul are various forces or forms, those things which are ascribed to us in respect of these forms will be predicated of one another accidentally. Now in respect of the intellective soul we are said to be men, according to the sensitive soul animals, according to the nutritive soul living. Therefore this predication Man is an animal, or An animal is a living thing, will be accidental. But it is a per se predication, since man, as man, is an animal, and animal, as animal, is a living thing. Therefore it is from the same principle that one is a man, an animal, and a living thing. Notes Socrates in the choir? 2 If, however, it be said that even if the aforesaid souls be distinct, it does not follow that the predication mentioned will be accidental, because these souls are mutually subordinate: we reply to this also. For the sensitive power is subordinate to the intellect, and the nutritive power to the sensitive, as potentiality is subordinate to act: for the intellect comes after the sensitive, and the sensitive after the nutritive in the order of generation; since in generation an animal is made before a man. Consequently if this order makes the aforesaid predications to be per se, this will not be taking per se in the sense that arises from the form, but in that which arises from matter and subject, as a superficies is said to be coloured. But this is impossible. Because when we use per se in this sense, that which is formal is predicated per se of the subject, as when we say: The superficies is white or The number is even. Again when we use per se in this way, the subject is placed in the definition of the predicate, as number in the definition of even. But here the contrary happens: because man is not predicated of animal per se, but contrariwise: and again the subject is not placed in the definition of the predicate, but vice versa. Therefore the aforesaid definitions are not made per se by reason of the order in question. Notes Plus everybody knows, or used to before they pretended not to, that plants are lower than animals are lower then men. 3 Further. A thing has unity from the same cause as it has being; for one is consequent upon being. Since then a thing has being from its form, it will have unity also from its form. Consequently if we say that there are in man three souls, as different forms, man will not be one being but several. Nor will the order of forms suffice for the unity of man: because to be one with respect to order is not to be one simply; since unity of order is the least of unities. 4 Again. The aforesaid difficulty will again arise, namely that from the intellective soul and the body there results one thing not simply but only accidentally. For whatever accrues to a thing after its complete being, accrues thereto accidentally, since it is outside its essence. Now every substantial form makes a complete being in the genus of substance, for it makes an actual being and this particular thing. Consequently whatever accrues to a thing after its first substantial form, will accrue to it accidentally. Hence, since the nutritive soul is a substantial form,–for living is predicated substantially of man and animal,–it will follow that the sensitive soul accrues accidentally, and likewise the intellective. And so neither animal nor man denotes one thing simply, nor a genus or species in the category of substance. Notes The statement “For whatever accrues to a thing after its complete being, accrues thereto accidentally, since it is outside its essence” is almost tautological, following directly from the definition of essence. The tattoo you adorn yourself with is accidental (and we can only hope in both senses of the word). 5 Moreover. If man, in Plato’s opinion, is not a thing composed of body and soul, but a soul using a body, this is to be understood either of the intellective soul only, or of the three souls, if there be three, or of two of them. If of three or two, it follows that man is not one thing, but two or three, for he is three souls or at least two. And if this be understood of the intellective soul only, so that the sensitive soul be understood to be the body’s form, and the intellective soul, using the animated and sensified body, to be a man, this would again involve absurdities, namely that man is not an animal, but uses an animal; and that man does not sense but uses a sentient thing. And since these statements are inadmissible, it is impossible that there be in us three souls differing in substance, the intellective, the sensitive, and the nutritive. Notes Later—much later—we’ll see how angels (good or bad) can use a body in a crude sense of a ghost in a machine. But an angel in a body is not a man. 6 Further. One thing cannot be made of two or three, without something to unite them, unless one of them be to the other as act to potentiality: for thus are matter and form made one thing, without anything outside uniting them. Now if there be several souls in man, they are not mutually related as matter and form, but are only supposed to be acts and principles of action. It follows consequently, if they be united to form one thing, for instance a man or an animal, that there is something to unite them. But this cannot be the body, since rather is the body united together by the soul, a sign of which is that when the soul departs, the body perishes. It results then that there must be something more formal to make these several things into one. And this will be the soul rather than those several that are united by this thing. Wherefore if this again has various parts, and is not one thing in itself, there will still be need of something to unite them. Since then we cannot go on indefinitely, we must come to something that is one in itself. And such especially is the soul. Therefore there must be but one soul in one man or in one animal. 7 Again. If that which belongs to the department of the soul in man is composed of several things, it follows that as the whole together is to the whole body, so each of them is to each part of the body. Nor does this disagree with Plato’s opinion: for he placed the rational soul in the brain, the nutritive in the liver, and the appetite in the heart. Secondly, because it is evident that the operations of different parts of the soul are observed in the same part of the body: as evidenced in animals which live after being cut in two, since the same part has the movement, sensation, and appetite whereby it is moved; and again the same part of a plant, after being cut off, is nourished, grows and blossoms, whence it is evident that the various parts of the soul are in the one and same part of the body. Therefore there are not different souls in us, allotted to different parts of the body. 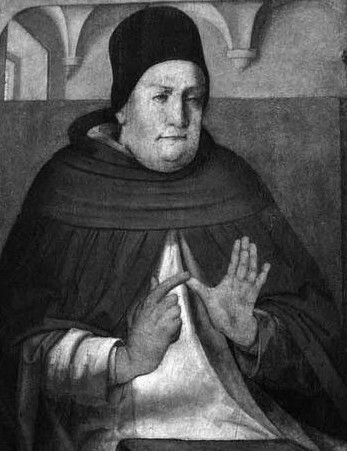 Notes Besides the most important note inserted inline, it appear Aquinas was a fisherman: think worms. 8 Moreover. Different forces that are not rooted in one principle do not hinder one another in acting, unless perhaps their action be contrary, which does not happen in the case in point. Now we find that the various actions of the soul hinder one another, since when one is intense another is remiss. It follows, then, that these actions, and the forces that are their proximate principles, must be reduced to one principle. But this principle cannot be the body, both because there is an action in which the body has no part, namely intelligence; and because, if the body as such were the principle of these forces and actions, they would be found in all bodies, which is clearly false. Consequently it follows that their principle is some one form, by which this body is such a body: and this is the soul. Therefore it follows that all the soul’s actions which are in us, proceed from one soul. Wherefore there are not several souls in us. Notes Next week, more proof the intellect is not something separate from us, but is us. That’s why it only wears one shoe! Furthermore the eternal motion of a body set in motion is an assertion without evidence which one can dismiss without evidence. I”l bet socrates sang like an angel. He wasn’t allowed to sing sad songs. They were confiscated. Bass Baritone probably. From where does this notion come? It’s certainly not considered true. The mind appears fractured in a way not fully understood but is known to be in chemical imbalance and corrected by medication. Far from saying that there is more than one soul. It is not even true to say that a person can have a split personality. The person suffering from Schizophrenia recognises when symptoms start and particularly if they are self aware. This would seem to me to be a sign that there is an overlay effect rather than the idea of two or more souls ‘fighting’ for mastery. forget the last part ‘without evidence’ Hitchens quip, it’s tautological rhetoric. If I say I’m drinking tea. Do you require evidence? If you dismiss the statement because there is no evidence that would be silly. Then you might say something about ‘likely’ but you can only say something about probability given evidence. So you are arguing to dismiss without evidence given the importance of the proposition? Furthermore evidence comes in different forms in any event and to argue against the existence of eternity is to argue something irrational in the sense that eternity must exist. It must exist by some form of induction, who knows. Soul and eternal go together. Personality has a separate dimension to soul. 1. At risk of upsetting someone I can help saying told you so. Jesus didn’t read this text and his father forgot to tell him. 3 Perhaps these things can be considered separately or sensed separately, that’s how I like to think of this. I have always argued that the whole thing is one and that there is a kind of soup which is the body, which is combined with the soul. I mean soup figuratively speaking, to keep things open. 5. much of the translation doesn’t make for clear understanding but I didn’t give it much time. Some of it looks like sophistry to me. I’m intrigued as to why it must remain in arcane language. This doesn’t strike me as terribly straight forward. was what I meant to say.